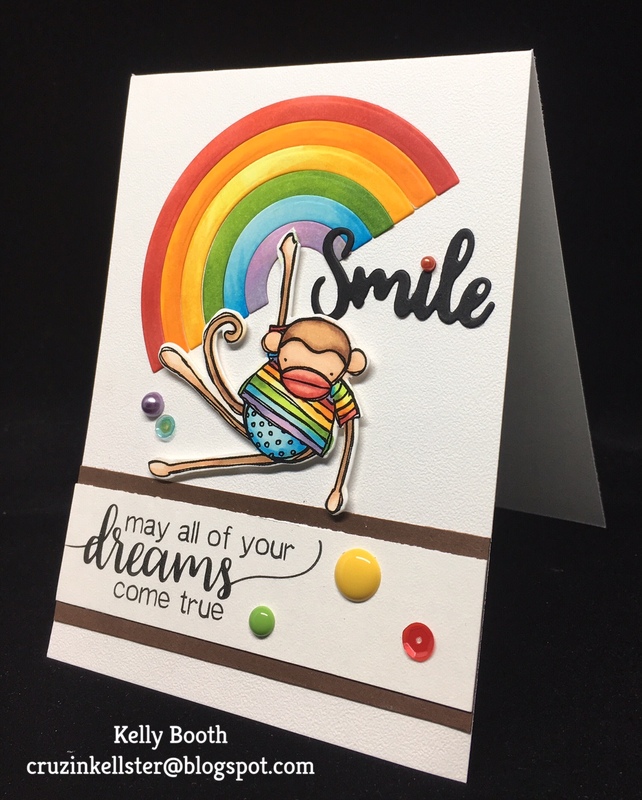 This is the first challenge for the Coloring Team at Elizabeth Craft Designs and I'm excited to show you a cute card using a little monkey from the Jungle Cuties set. I used the New die cut words Smile and the Rainbow by Joset Designs colored with Copics to match the Monkeys shirt. The sentiment is also New one by Joset Designs.... I love that the New images have matching dies to cut them out too! Be sure to check out the challenge blog post at Elizabeth Craft Designs and see all the Amazing designs by the coloring team. They are sure to WOW you with these Fun New stamps! Thank you for stopping be and have a perfect day! Such a fun and cheery card. Sure to brighten someone's day. Blog Hop with Karen Burniston Products and Dark Room Door Stamps! Sneak Peek of some NEW Karen Burniston Dies coming June 1st! Loving the Life I Color is a personal hobby blog with the sole purpose of sharing paper crafting projects. I don't make use of any personal information shared in any comments or any third-party applications such as email subscription services. I Love to Create ART and dabble in all types of media. I am a very LUCKY girl to have a WONDERFUL Husband, two WONDERFUL daughters....and Three Beautiful grand babies that I just love to pieces! I Love Lawn Fawn rubber Stamps!! Karen Burniston in cahoots with Riley and Elizabeth Craft Designs generously supply me with complimentary product for promotional purposes: However, my enthusiasm in promoting their product does not stem from the fact that I am compensated by them, but because I feel their product lines and services to be superior in this industry.